Sink your teeth into a juicy flame broiled burger. Just like filet mignon, aspiring chef Heidi is convinced that burgers are fine cuisine too. Gather essential fixings like cheese and tomatoes to top your patties for perfection. Meet quirky customers like the Mime and the singing Diva. 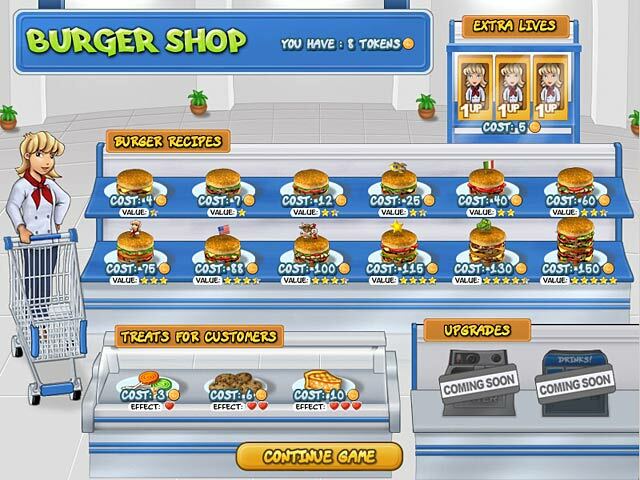 Fill their orders and visit the Burger Shop for new recipes, upgrades, and treats to keep your patrons patient in Burger Rush. Become the chef du jour! Burger Rush is rated 3.9 out of 5 by 11. Rated 5 out of 5 by mk33 from Need a MAC version I love this game. It is challenging at times. But I now have a MAC and can't play anymore. Please make a MAC version. Rated 5 out of 5 by Lovelyaprilb from Awesome This has been one of my favorite games for over 5 years and Resturant Rush is awesome too. They need a Burger Rush 2 to keep it going. Rated 5 out of 5 by gramdma_frog from Fun game I was surprised to find so few reviews of this game. I would probably classify it as a match three rather than time management. It is one of the type that requires matching specific items to make certain foods. I have owned this game for a long time and play it over and over. You really set the level of challenge by buying more expensive recipes and selecting bonuses that help customer satisfaction and increase sales amounts. The more expensive burgers require more ingredients and take longer to match. I get a kick out of the different characters and their comments, so if you enjoy that kind of thing, be sure to have the sound turned on. Rated 4 out of 5 by LadyMorganFox from Pretty relaxing I like this game because there is some challenge, but nothing impossibile to achieve. It's the kind of game I play when I don't want to get mad after bonuses, gold medals and time challenges. This match-3 game is pretty easy. 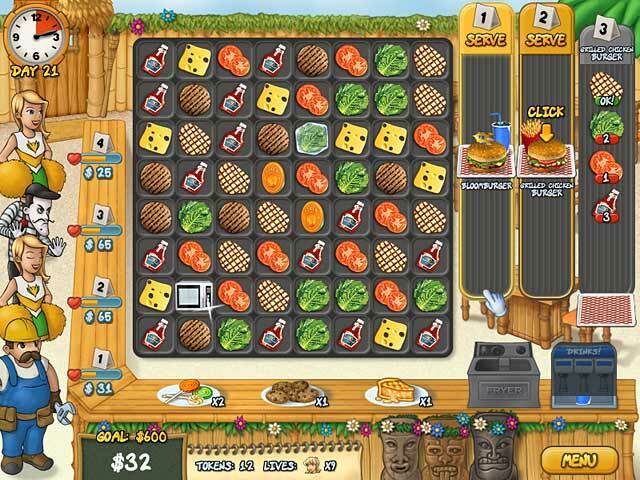 The only problem: after playong it, you want to eat some juicy burgers! The grafics are well done but the music is a little bit boring. Rated 4 out of 5 by Y__Y from Switchin` Foods! nice game. I`ve played it before. Rated 3 out of 5 by Aamaretto from This is a Match-3 Game! I really dislike Match-3 games, so I'm giving it as diplomatic of a rating as possible. If you enjoy them, you'll probably enjoy this. But I don't think it should be classified as a TM game. Rated 3 out of 5 by egeorge18 from Simple yet somewhat interesting ! 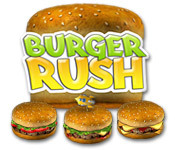 Burger Rush was Easy and received little interest, not your best game and I won't be buying it. 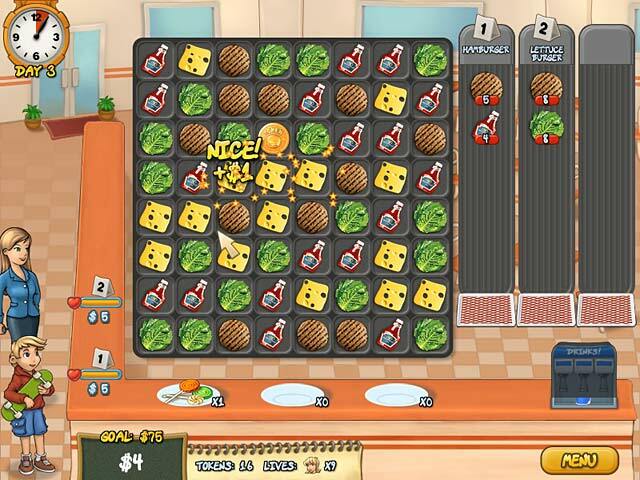 Aspiring chef Heidi is convinced burgers can be fine cuisine - help her serve patties in this Time Management whopper.